Home IPO OTC Markets (OTCM) & Canadian Securities Exchange Teaming Up? OTC Markets (OTCM) & Canadian Securities Exchange Teaming Up? WOW. What a chart! Why invest on a stock listed on the OTC when you can buy the Lister. 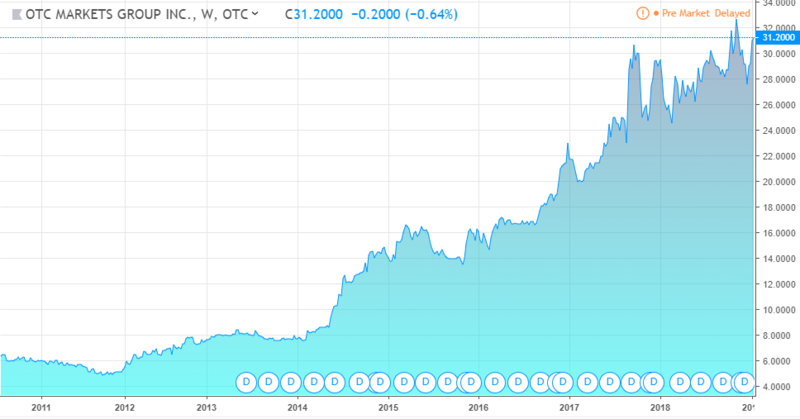 As of December 31, 2018, there are 446 cannabis-related securities trading on OTC Markets Group’s OTCQX, OTCQB, and Pink Markets with a total market cap of $20.7 Billion. NEW YORK and TORONTO, Jan. 11, 2019 /PRNewswire/ — The Canadian Securities Exchange (CSE), a Canadian listing exchange recognized as a Qualified Foreign Exchange in the U.S., Kapoor Kapital, and OTC Markets Group Inc. (OTCQX: OTCM), operator of financial markets for 10,000 U.S. and global securities, announce that they will co-host the exclusive Canada Cannabis House at 64 Promenade in Davos, Switzerlandtaking place January 22-25, 2019. With the rapidly advancing global expansion of cannabis legalization, this iconic international location will convene industry leaders and senior executives from publicly-traded cannabis companies influenced by the Canadian listing and trading experience. “The CSE is pleased to showcase Canada’s leadership position in the development of the global cannabis industry to the Davos community. Canadian companies have a wealth of knowledge and experience in the corporate finance and policy development as well as the technologies that optimize the cultivation, extraction and delivery of cannabis and hemp-based products. As the home to the greatest number of public cannabis and hemp-related companies, the CSE is in a unique position to provide a forum for these companies to share their capabilities with peers from around the world”. As of December 31, 2018, there are 446 cannabis-related securities trading on OTC Markets Group’s OTCQX, OTCQB, and Pink Markets with a total market cap of $20.75bn. MedMen Enterprises Inc. (MMNFF), Green Thumb Industries Inc. (GTBIF) and MariMed Inc. (MRMD) are among the top 5 cannabis-related companies traded on OTC Markets based upon market cap. The CSE also ended the year with a total of 124 cannabis-related issues, representing an enterprise value over $25bn. Canaccord Genuity is the global capital markets division of Canaccord Genuity Group Inc., offering institutional and corporate clients idea-driven investment banking, merger and acquisition, research, sales and trading services from offices in North America, UK & Europe, Asia, Australia and the Middle East. Our diverse team of capital markets and advisory professionals has deep industry and transactional expertise in key growth sectors of the global economy. We are committed to providing valued services to our clients throughout the entire lifecycle of their business and operating as a gold standard independent investment bank – expansive in resources and reach, but targeted in industry expertise, market focus and individual client attention. We are driven by your success. Previous articleCROP Corp., (CRXPF) Updates on 40 Acre Nevada THC Farm! Next articleHoly Crap. 446 Publicly Traded Cannabis – Marijuana Related Stocks in the US!